Millions of people suffer from depression caused by systemic yeast infections every year and the cause is absolutely in most cases "unknown". One thing is certain about modern medicine and the brain and nervous system, and that is there are very few knowns. But since it is known that fungi such as candida albicans can penetrate any area of the body, then disorders of the brain and nervous system could very well be linked. So what is known? In 1996 Principals and Practice of Clinical Mycology talked about research done on meningitis, "itis" means an inflammation of the tissues. If yeast and fungus can make bread swell (rise) couldn't it cause brain tissue to swell also? Yep, a fungus is the cause. There are six known fungi that can penetrate the meningis including candida albicans, the most common major cause of systemic yeast infection. In a study done by W.G. Crook M.D. and published in the Journal of the American Medical Association: An article called "Depression Associated With Candida Albicans" fell on deaf ears within the medical community. In the Journal of Nutritional Medicine 1990 an article written by A. Hunnisett discusses the auto brewery syndrome. This is a condition where carbohydrates ferment in the intestine creating alcohol. 69% of Hunnisett's patients who consumed 50 grams of glucose, one soda to give you an idea, an hour later had alcohol in their blood stream. Auto brewery Syndrome was proven again in a study done in 2013 which was published in the International Journal of Clinical Medicine. 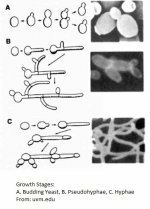 Candida albicans, Candida krusei, Candida glabrata, and Saccharomyces cerevisiae where all implicated as causative agents. Now if everyday people are consuming potatoes, sodas, grains, beans, etc, 69% of them are producing alcohol within their bodies, of course the hangover also is a result of that. This is all so mild that a person would not notice the alcohol feeling, but don't you think it is possible that this mild hangover could be the cause of their depression and brain fog? In candida sufferers the emotional roller coaster ride can be quite severe. You can be happy one minute and suffer from depression the next. Then comes fits of anger or being very short tempered, and they can get extremely frustrated very quickly for no apparent reason. Many people with this condition will experience many emotions and I sometimes wonder if this isn't a leading cause of divorce in the US that is unknown to many. If you have any questions about depression, systemic yeast infections or yeast infections in general? Use the form on the contact page.